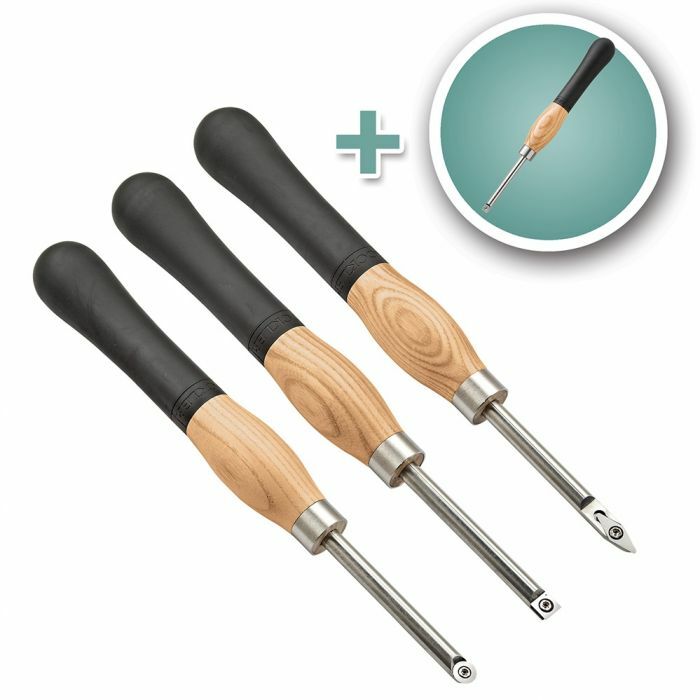 Get all four of our Mini carbide profiles in one cost-saving set! Includes round, diamond, square and square radius profiles. Each tool features a replaceable, rotatable cutter that eliminates the hassle and downtime of sharpening. Simply rotate the carbide cutter for a fresh, sharp edge, and replace it once all available edges have grown dull. The solid carbide cutting edges stay sharper, longer when compared to steel. The handles are turned from fine, solid ash, and feature an ergonomic rubber overmold that enhances your grip and reduces fatigue. 13-1/2" long overall. Diamond Carbide Mini Turning Tool is ideal for use as a parting tool, and for tight profiles. Overall length of the diamond cutter is 1-1/8''. Angle of diamond cutter is approximately 35 degrees. Square Carbide Mini Turning Tool is ideal for flat or convex areas on spindles and pen turnings. Square cutter is 3/8'' square. Round Carbide Mini Turning Tool is ideal for producing a smooth finish on curved, concave surfaces and for general turning applications. Diameter of the circular cutter is just under 1/2''. Square Radius Carbide Mini Turning Tool features a subtle 2'' radius that works perfectly for smoothing cuts. Cutter measures approximately 1/2'' square with a 2'' radius on all four edges.